Lewis Systems’ synthetic lubricants are not only “greener” than petroleum, they outperform their petroleum counterparts and can provide up to 8,000 hours of uninterrupted operation. These lubricants, used on a rotary screw or rotary vane compressor, can perform at temperatures up to 195 degrees Fahrenheit, providing a varnish-free environment with top notch protection against rust and corrosion. The greatest threat to your compressor is heat, which quickly accelerates the rate of oil oxidation, weakening and causing damage to your o-rings and seals. The synthetic lubricants at Lewis Systems, Inc. act as a coolant, drawing the heat away from the compressor, and thereby providing maximum protection to the sensitive parts that need it most. With this protection, oil consumption is significantly reduced. Therefore, waste is reduced. 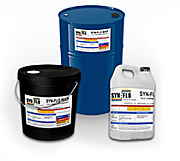 Our synthetic lubricants are H-1 food-grade quality and meet FDA requirements. They completely separate from water and keep carbon and varnish buildup to an absolute minimum. This, along with the reduced waste that comes from consuming less oil, makes synthetic lubricants far friendlier to the environment than petroleum lubricants. Our synthetic lubricants are ideal for anyone trying to protect the working life of their compressor, as well as those who want to protect the environment. When you choose to make the switch to synthetic lubricants, you can save on maintenance costs, reduce lubrication consumption, and save energy. You have invested a lot into your equipment. Protect that investment, enhance its performance, and “go green” all at the same time. The choice is obvious. Get away from petroleum lubricants! Contact Lewis Systems or visit us at our Lynchburg location today for more information on how you can save by making the switch to synthetic lubricants.